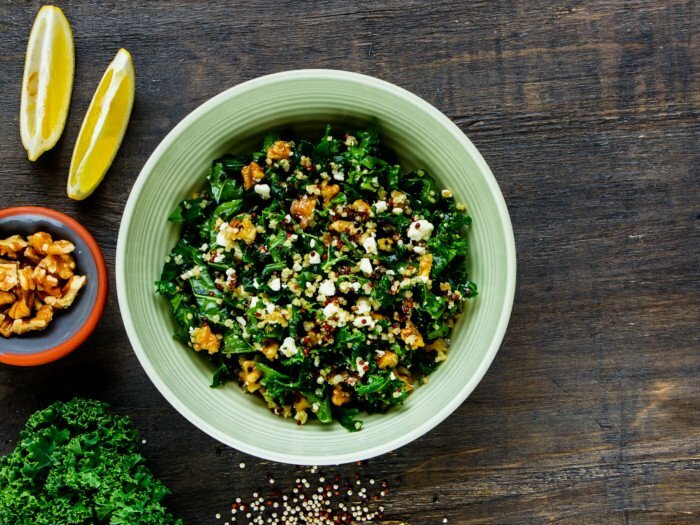 This salad combines two great superfoods — Kale and Quinoa! Nourishing, delicious, and super quick to make, this is also a great option for food-to-go. When packing for lunch box, keep the dressing separate and mix in before eating. The healthy go-to meal when you're on the run! To make kale and quinoa salad, begin by bringing 2 cups of water to a boil in a stockpot. Add the quinoa along with a little salt and olive oil. Cover and let it cook on medium ﬂame till the quinoa grains have absorbed all the water. It takes about 10 mins. Fluff it with a fork, and keep it aside to cool. Place the cooked quinoa in a big mixing bowl. Add kale, walnuts, and feta. Toss to combine them and keep it in the refrigerator to chill till it is time to serve. Just before serving, drizzle the dressing over the salad and mix well. Enjoy the dish cold. If you are packing this salad for your lunch box, keep the dressing separate and mix it before eating. That way the salad retains its freshness and doesn't become soggy. While in this recipe I have only added kale, you can make quinoa salad with a mix of crunchy and soft vegetables like this vegan quinoa salad recipe (https:// www.myweekendkitchen.in/vegan-quinoa-salad/).